Global Medicine: Is it Complementary, Integrated, Alternative---or just plain Mainstream? What is considered experimental or complementary medicine in America, is often considered mainstream medicine on the global scene. This is true in scientifically sophisticated countries such as France, Germany, Japan and the United Kingdom. Clinicians are deeply concerned with the terrain, or the vitality of the inner field of the body. While American interventions are often described as "aggressive," the French much prefer les medicines douces, or "gentle therapies." ...however, patients appear to fare equally well in these countries as in the United States. :sidebar: Consider the photo here! 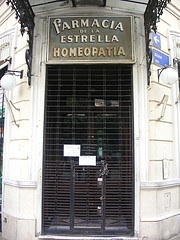 In Buenos Aires, we see an entire pharmacy devoted to homeopathic medicine. Not a common sight in the United States. Curious for more information on homeopathy? Choose this link for an Introduction to Homeopathy. They love homeopathy in Europe! 1 in 5 German doctors. 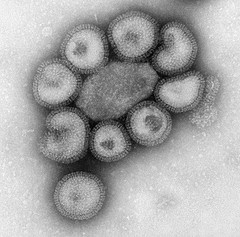 To read entire article, use photo link of flu virus! The #1 top-selling flu remedy in France? You guessed it: homeopathic medicine (representing 50 percent of the market). By its very name, complementary medicine accompanies another medicine. In this case, it accompanies conventional medicine--surgery, antibiotics, chemotherapy, radiation and the like (here in the U.S.). Just over 100 years ago, herbal remedies were still widely known and used for general health. The Industrial Revolution meant that by 1900, most people lived in towns. Any connections with country knowledge - such as these herbal treatments - were largely lost. Enter Penicillin in the late 1920's. 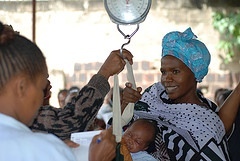 This gave rise to immunizations, a strong component of our present-day health terrain. Immunizations for children continue to expand! (My first two children, born early in the 1990s, contracted the childhood disease of chickenpox shortly after they began attending public school. However, after our third child was born in 1998, I had to sign a waiver "on philosophical grounds" to keep him from being vaccinated against chickenpox. So, the irony is that the new, complementary medicines are often older remedies that were actually lost during recent history! Just as present day medicine looks different from the past, medical mindsets differ from country to country around the globe! I hope you enjoy your reading, comparing and exploring. For very good definitions of complementary terms holistic, allopathic, and globalized medicine, use the photo link below to read David Farr's page defining these terms! To return to Healthy Alternative Solutions, simply close the page. Return from A Global Perspective to site map on Home Page.